Late onset forms (less common): these have a slower progression that begin later in childhood/adulthood. Genetic deficiency of the enzyme hexosaminidase A is responsible for this condition. Hexosaminidase A enzyme normally will process GM2 gangliosides, so when it is no longer active, these substrates begin to accumulate. The casual mutation is found on chromosome 15q23 and involves the HEXA gene (many mutations have been identified). The accumulation of GM2 gangliosides will cause a variety of issues within the body (depending specifically on WHERE it is accumulating). 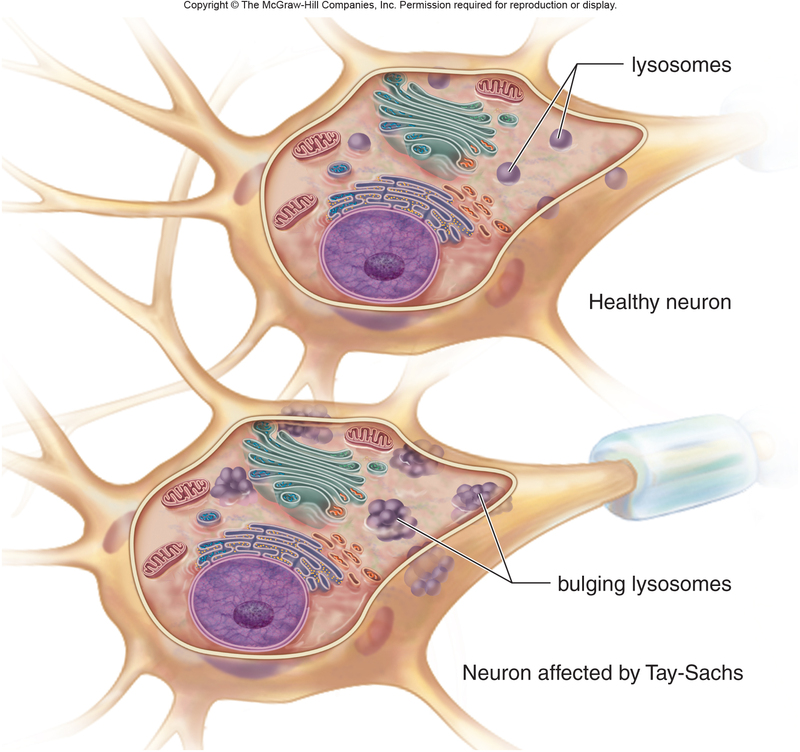 Often times various cells of the nervous system will accumulate these gangliosides, and this can lead to various serious effects such as blindness, hearing loss, and cognitive impairment. Jewish ancestry (especially of european descent). Initial Presentation: In most cases this disease will present initially in young infants. It will be the parents of the child that will often notice the early warning signs of this disease. Patients will be normal at birth, and only develop symptoms after the sphingolipids accumulate in the body. Blindness: infants may have decreased eye contact and will be startled easily. Muscle weakness: infants will have progressive patterns of muscle weakness. Parents may notice difficulty with head control. Motor exam can demonstrate hypotonia initially. Spasticity may develop later on as the disease progresses. Fundoscopy can show the presence of a cherry-red spot. This is due to the accumulation of GM2 gangliosides all around the fovea (changing the pigment of the fundus everywhere expect directly over the fovea). The goal of the clinical workup is to evaluate for activity of the hexosaminidase A enzyme: this can be done in a few different ways. Measuring enzymatic activity of hexosaminidase A can be done from patient serum. In affected patients this enzymes activity will be low/absent. Conformational genetic testing of the HEXA gene can help identify the casual mutation that is responsible for the decreased activity of hexosaminidase A. The decreased activity of hexosaminidase A in patient serum is essentially diagnostic for Tay Sachs disease. The complimentary genetic testing will further confirm this diagnosis. Death: the early onset form of this condition is fatal and often causes death by the ages of 3-5 years old. There is no treatment that targets the underlying etiology of this condition. Current treatment modalities are primarily only supportive measures to patients. Prognosis will depend on the exact Tach-Sachs disease subtype, however the most common (infantile) form is lethal and patients do not survive past 5 years of age. This condition is genetic and is not preventible.